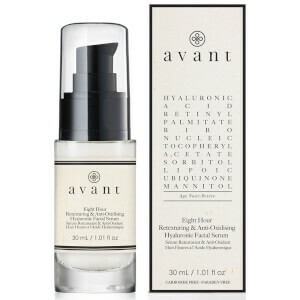 Rediscover your skin's youthful capacity with Avant Skincare's 8 Hour Anti-Oxidising and Retexturing Hyaluronic Facial Serum, a potent solution that protects against external aggressors while addressing signs of ageing. Part of the brand's Age Nutri-Revive range, the hydrating serum has been formulated to nourish skin from within and combat a number of imperfections, from enlarged pores to uneven tone, fine lines and dullness. Its combination of rare and signature ingredients work in synergy to protect against pollution and promote renewed skin texture for a more youthful appearance. Hyaluronic Acid delivers moisture into skin, plumping out the appearance of fine lines and wrinkles, while Lipoic Acids, with tightening and antioxidant properties, improve skin's texture and help to fade the look of dark spots. Skin's natural barrier is strengthened; the complexion appears firmer, brighter and younger. For maximum absorption, be sure to wash your face with tepid water before applying your serum. Then tone and exfoliate. Apply a few drops of serum to damp skin after cleansing or mist skin with an alcohol-free toner for quick, deep absorption. Press serum into skin with an open palm instead of fingertips to release active ingredients. Wait 2 to 3 minutes to allow serum to fully absorb before moisturising.